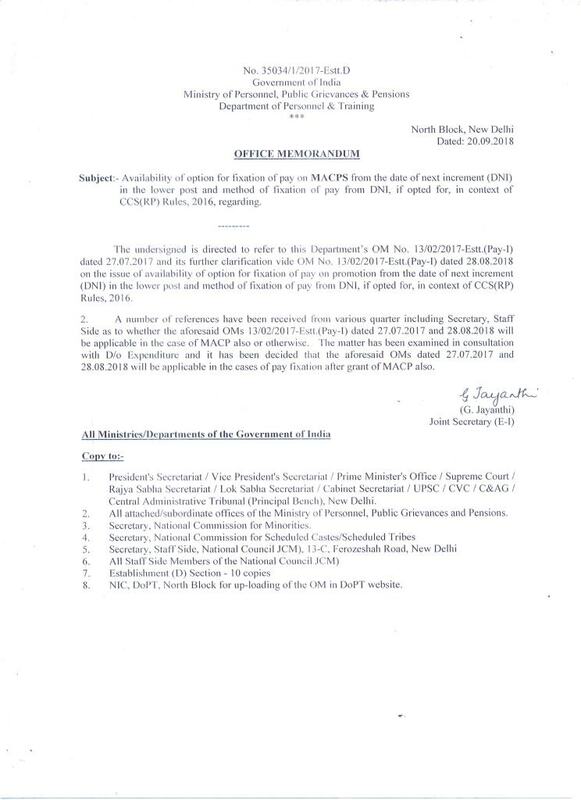 Subject - Availability of option for fixation of pay on MACPs from the date of next increment (DNl) in the lower post and method of "fixation of pay from DNI, if opted for, in context of CCS (RP) Rules. 2016, regarding. The undersigned is directed to refer to this Department’s OM No. 13/02/2017-Estt. (Pay-I) dated 27.07.2017 and its further clarification vide OM No. 13/02/2017-Estt. (Pay-I) dated 28.08.2018 on the issue of availability of option for fixation of pay on promotion from the date of next increment (DNI) in the lower post and method of fixation of pay from DNI, if opted for, in context of CCS(RP) Rules, 2016. 2. A number of references have been received from various quarter including Secretary, Staff Side as to whether the aforesaid OMs 13/02/2017-Estt. (Pay-I) dated 27.07.2017 and 28.08.2018 will be applicable in the ease of MACP also or otherwise. The matter has been examined in consultation with D/o Expenditure and it has been decided that. the aforesaid OMs dated 27.07.2017 and 28.08.2018 will be applicable in the cases of pay fixation after grant of MACP also.